As a child, I would go with my family to places like the Miami Seaquarium and watch all the live human-animal interaction shows. Trainers were swimming with dolphins, doing tricks with killer whales, playing with sea lions, etc. These shows fascinated me. 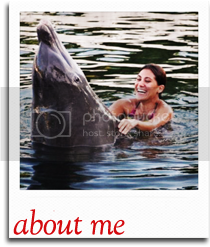 I loved animals, and getting to watch a woman swim with a whale evoked my own desire to interact with these creatures. 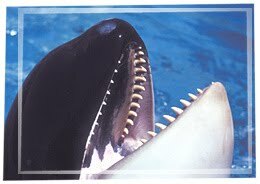 Killer whales are beautiful and, as my child mind deduced from the live shows, cuddly and playful. Just like a puppy! But, I was a child when I had these thoughts. These shows are meant to capture the emotions of children and help them develop a connection and love for animals. And that's really important! As an animal lover, I feel its so important for children to grow up with a sense of connection to the other animals in the world. The love of animals instilled in people as children is what helps motivate them as adults to conserve and protect the environment, help living things in need, and prevent species from going extinct. That being said, as an adult, though hopefully one's love of animals remains, one's perceptions of animals as living things should change. Adults should realize that elephants do not wear green suits and gold crowns like Babar. Instead, they are giant animals who have the power to easily trample a person if they feel the need to defend themselves. Bears do not dress up in bow-ties and cuddle in bed with us like so many of our stuffed animals did as a child. Bears can attack and kill you. It is best to stay away from them. After all, when you go camping, everyone knows to tightly pack up your food to avoid a bear encounter. You do not leave out food to attract them. And killer whales.. well, killer whales are called that for a reason. They can be trained, of course, but they also have massive teeth and more than enough strength to kill a person, intentionally or not. They are not guests for your pool party. "SeaWorld recognized the inherent risk of allowing trainers to interact with potentially dangerous animals. Nonetheless, it required its employees to work within the pool walls, on ledges and on shelves where they were subject to dangerous behavior by the animals." HELLO?? Am I missing something here? Isn't that THE JOB? Isn't that what these trainers signed up for? Wasn't that part of the job description? If SeaWorld deserves to be sued, then so does the fire department. So does the military. So does Nascar. So does every national sports league. So does the police department. There is a risk with all these occupations, just to name a few. Every employee of these organizations is required to work and interact in a potentially dangerous situation, and to be subject to dangerous behavior by others. Each head of these organizations do recognize the inherent risk of these employees to perform their jobs. So, unless the government plans on fining every zoo, every theme park, every sports organization, every police department, every fire department, etc., it should really lay off Sea World. Don't get me wrong, what happened was a tragedy. So was Dale Earnhardt's fatal crash. So is the death of every policeman, fireman, and soldier killed on the job. So why don't we sue Nascar and the government itself? We don't because that's the job. If you sign up for a dangerous, potentially fatal job, there is always that chance of something horrible happening. But, people need to be responsible for their own choices. If you aren't willing to take the risk, don't sign up for it. 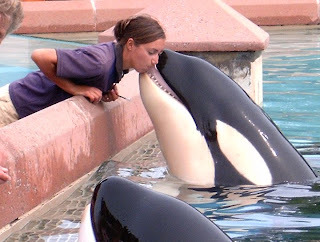 And I'm sure less people get killed from working at Sea World than from any other profession I mentioned above. Next thing you know, your heavyweight champion will be walking out of the ring with a championship belt and a subpoena. After all, he beat somebody up. And you'll all be yelling, "It's called boxing, people!" I also got to jump in with the dolphines a year later. It's too bad they don't do that anymore for liability reasons, but I'm glad to have gotten the chance to experience something in life that will never come again. Yes the killer whale names probably comes from all of those who orcas have killed, but in nature they have never killed humans. They kill because they are frustrated and they can't really unleash it anywhere. How would you feel like if you where ripped out of your mothers arms when you where a child and sent to somewhere just so you could entertain some stupid humans and live the rest of your life in one tiny room. It is not the orcas fault. The fault is humans. And of course as you said, the sea worlds fault. It's not a sea world it's a pool world.